Three emails surfaced in the Carmelo Garcia "ethnic cleansing" civil lawsuit currently ongoing in Hudson Superior Court with Hoboken's City Council elections just off in the distance on November 3rd. Hudson County View obtained and published exclusive emails detailing email communications between the mayor's husband Stan Grossbard and several Hoboken Housing Authority commissioners from early 2013. Three alleged emails published reveal actual context of discussions in how the HHA board might deal with an obstinate Executive Director in Carmelo Garcia and the outcome of one procurement contract, a renewal for HHA legal counsel Charles Daglian later rejected by HUD calling it "legally flawed." The HUD story was broken and exclusively reported on MSV back in March 2013. In that meeting, Garcia threatened members of the board they could face criminal charges if they did not approve a renewal of Daglian's legal contract. One of the HHA commissioners, Greg Lincoln appeared to be influenced by Garcia's suggestion/threat and voted to approve a contract renewal thus passing the measure. Daglian himself sat as a legal advisor at the board meeting advocating for his own contract's reapproval. 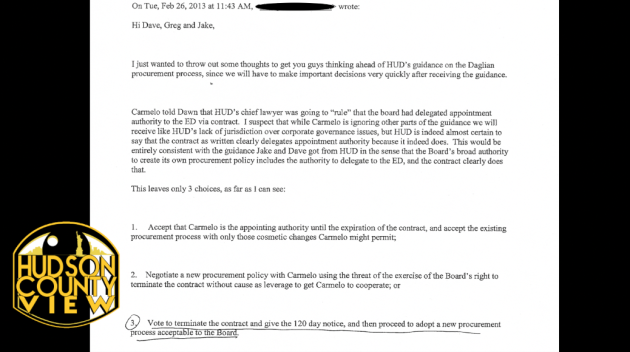 In the first email dated February 26, 2013, an idea is proposed for consideration how to deal with restructuring an Executive Director contract whereby similar vendor problems as the "legally flawed" one for Daglian would be avoided in the future. A recommendation was offered by Grossbard to terminate the contract and restructure it so that it would fairly reflect similar provisions of other Executive Directors in New Jersey. After HUD deemed Garcia's contract resolution for Daglian "legally flawed," he subsequently presented the same renewal contract to the HHA commissioners a half dozen times refusing to take "no" for an answer. Garcia's termination came in August 2014, almost a year and a half later after a number of problems were uncovered under a new HHA board led by current chair Dana Wefer. Talking Ed Note: The discussion of termination had been far more limited and out of context in the original PolitickerNJ story on Wednesday. The Hudson Reporter is expected to do its story this weekend which will likely fail to publish any full emails in their true context. It's not illegal for a newspaper to be biased and use limited emails to advance bias. As many know the Hudson Reporter never published nor reported a single email in the Bajardi v Pincus litigation after that case was thrown out of court. Those emails reported here and on Grafix Avenger pointed to the extensive and nefarious activities of Beth Mason political operatives against Hoboken residents and to sabotage the Hoboken University Medical Center. Garcia is quoted in the story claiming vindication re: his ethnic cleansing lawsuit. His contract however was never put up for any termination however in early 2013. At the last City Council meeting, one close Carmelo Garcia and Ruben Ramos ally, Perry Belfiore waved documents he claimed was a resolution terminating Garcia written by Grossbard. 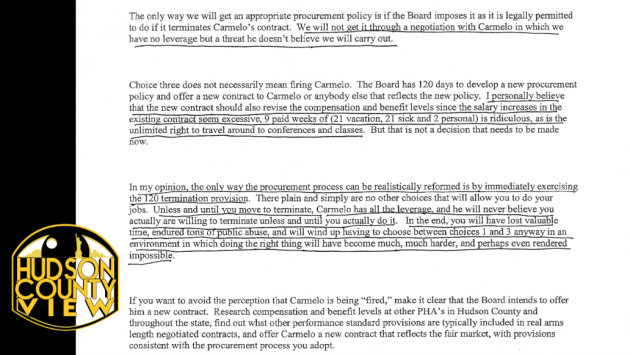 But the termination of Garcia took place much later under a different board. The contract termination came almost a full year and a half later when a lengthy list of additional Garcia transgression were illuminated to the public.